Amused themselves during 2-0 win over Solihull Moors. 👀 | It looks like striker @ScottQuigley1 has a few admirers! 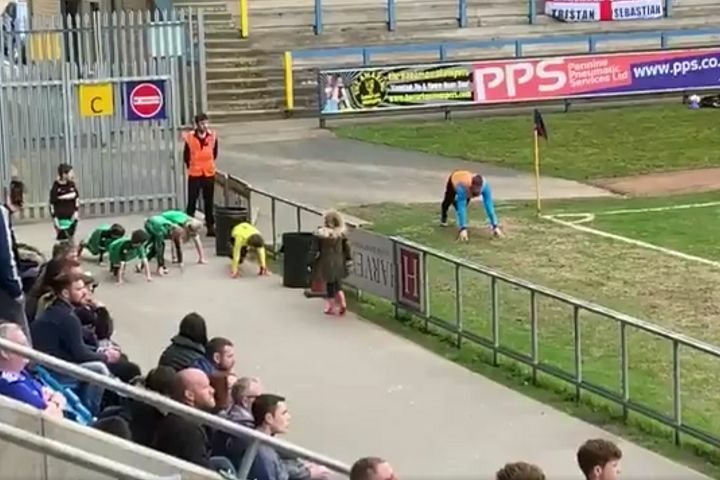 A group of children at the front of a stand at Halifax Town warmed-up next to one of the substitutes on the sidelines during a National League game. Halifax beat second-placed side Solihull Moors 2-0 at 5,830-capacity The Shay on Saturday. While the match continued on the pitch, several youngsters were spotted in full kit, mimicking the actions of 26-year-old striker Scott Quigley who was warming up before getting ready to come on. From behind a barrier separating the fans from the players, the gaggle of young supporters, who may have been the matchday mascots, can be seen taking part in the exercises.